Beauty Obodo, one of the lead singers and music minister in the National Mass Choir of The Redeemed Christian Church of God, finally releases her second official single and video, for the song titled 'WONDERFUL'. 'WONDERFUL'; according to Isaiah 9 vs 6; 'Wonderful' is one of the special names given to celebrate the birth of our Lord Jesus Christ. In this season, Beauty Obodo is engaging us in a call to worship, a time to celebrate God of His faithfulness in 2014. This single is produced by Afor for Malaga Records, is the second release single from the 13 track album titled 'Behold A New Thing', while this video is shot by Award winning Video Director - Mr OLUYINKA DAVIDS (iFocus Pictures). 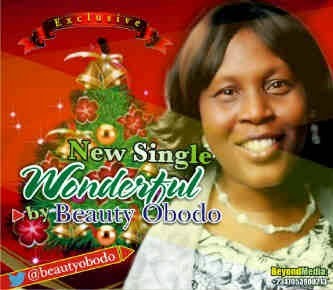 Beauty Obodo is a season psalmist, an educationist, an entrepreneur, a minister in God's Vineyard, a wife and a mother.